Tessolar Inc. has designed an innovative way to improve solar photovoltaic system performance and reduce installed system costs. After observing the current way in which solar panels are made, the founders of Tessolar Inc. decided to take action. Tessolar is providing two different products: Module Assembly and Tesserack. 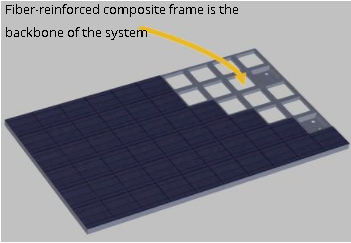 Their Module Assembly is the redesigned solar module architecture and assembly processes to enable the cost effective use of high performance materials. The Module Assembly is 10% more efficient than the next solar panel which allows it to produce 12% more energy. Their panels last for 35 years and are 30% lighter making instillation easier. Combined with their Tesserack, Tessolar is able to simply mount the system on to either the ground and/or rooftops installations. Tessolar partook in the 2016 Greentown Labs. The team went on to win the Sunrise Competition sponsored by DSM. The team is very excited about recently winning the Department Energy Grant. Thank you to Jaco Pretorious and Tessolar Inc for being SOLIDWORKS Entrepreneurs and sharing with our community. Isabelle Smith is the Education and Early Engagement Intern for SOLIDWORKS. Focused on helping Startups and Entrepreneurs reach their highest potential, Isabelle strives to continually increase her knowledge on the Startup world. She has worked with Entrepreneurs at numerous startup events, competitions, workshops and accelerators. Isabelle looks forward to continuing her career with startups world wide.